Old photographs with illustrated captions of the douce Stirlingshire spa town and the nearby village of Blairlogie. 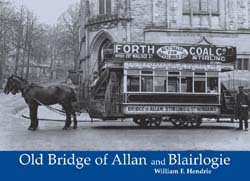 Among the subjects featured are horse-drawn trams, Bridge of Allan Station, Causewayhead, Wallace Monument, The White Bridge, various villas and hotels, Henderson Street, Fountain Road, U.F.Church, St.Helens School, the meal mill, Keir House, Airthrey Castle and more. Blairlogie is featured in a number of the photographs.